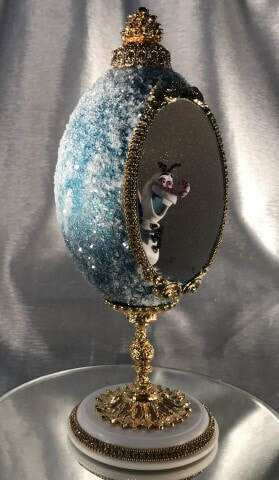 New Disney Themed Eggs Designs Coming Soon !!!!! ​Geppeto dreamed of a little boy of his own one day, when his wishes came true, his wooden puppet becomes Pinocchio. 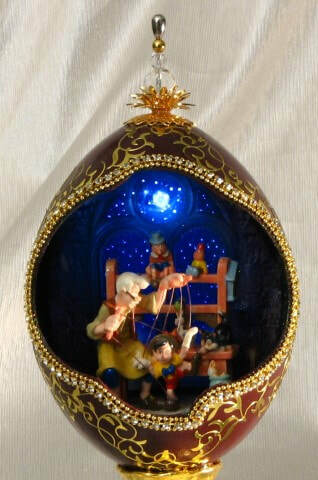 This Rhea egg designs captures this classic tale of Geppetto and Pinocchio in his workshop. 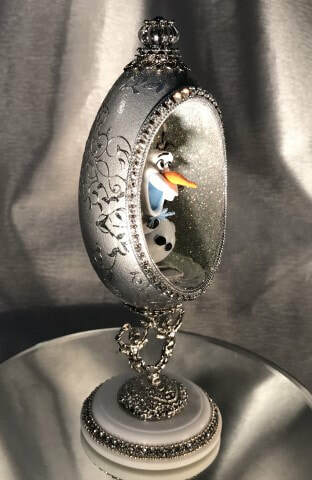 Looking through the window in this design, you can see the bright star that Geppetto wishes upon to make his puppet come to life. 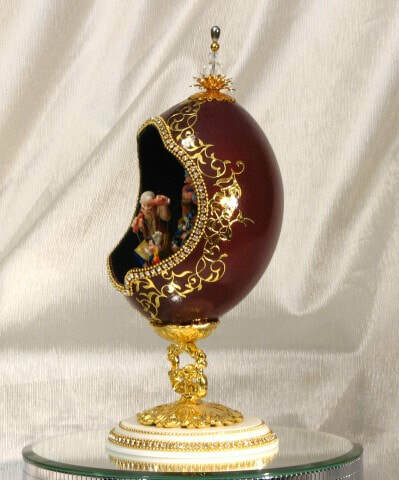 The push button switch with automatic shut-off after 30 seconds is used to illuminate the egg. A beautiful Austrian crystal chain trims the opening of our design, accented with decorative gold stickers and filigree. Our workshop is topped with gold filigree and crystals. 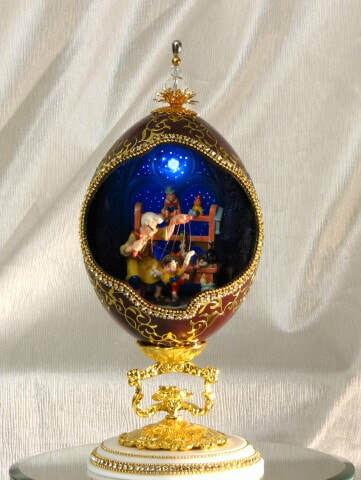 This classic tale is supported by a gold plated stand and jeweled corian base. 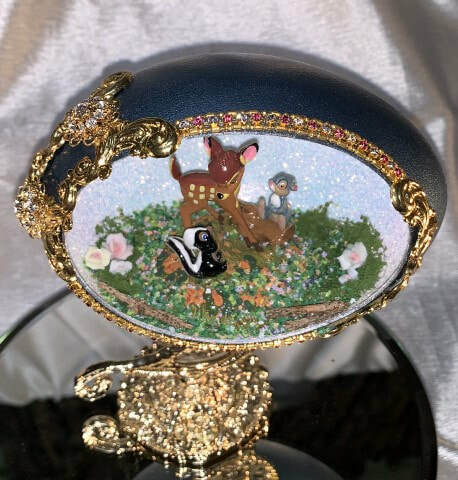 This Emu egg design was created with our friends Anna & Olaf together inside this hand cut egg, decorated with Austrian crystals and gold filigree. 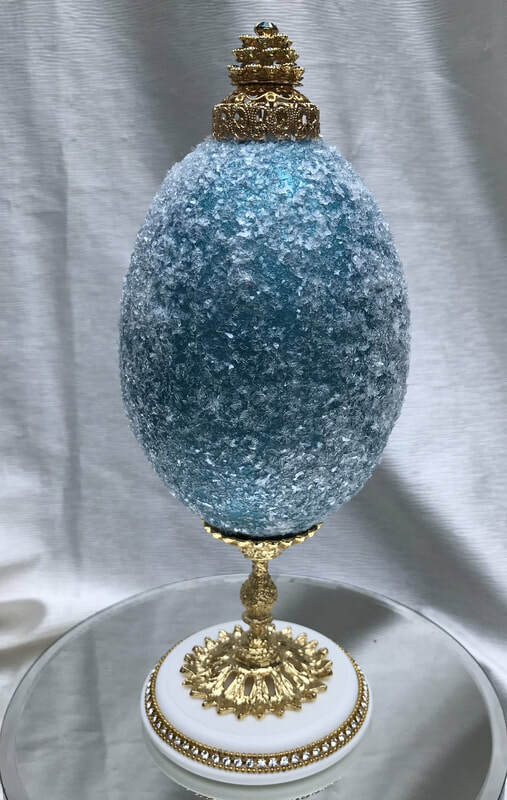 A beautiful 3 tier crystal top is used as a towering top piece as the egg design is supported by a gold plated stand and decorated corian base. The snow effect on the outside of the egg finishes our design as our friends play in the snow. 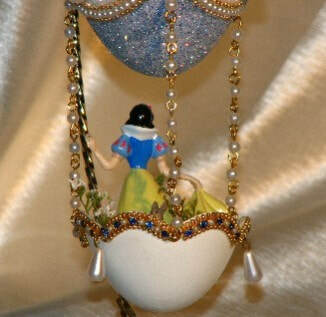 Once upon a time, long, long ago ......The classic tale of Snow White is captured in the wonderful balloon egg. 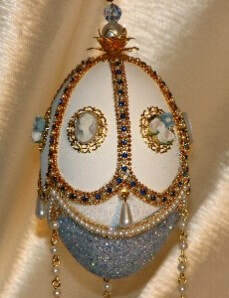 The design uses two goose eggs to create the balloon and basket design. 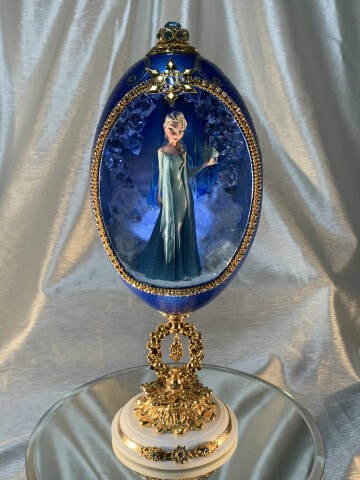 The balloon is decorated with a blue and pearl Austrian crystal chain and a row of pearls, then accented with ulta-fine blue glitter. 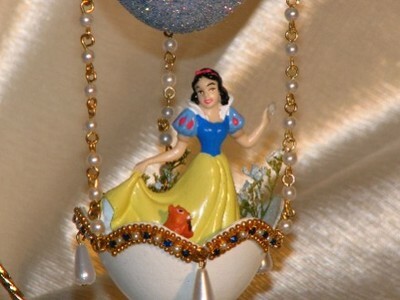 The design is enhanced by cameos and miniature flowers as it hangs from a finial and crystal top. 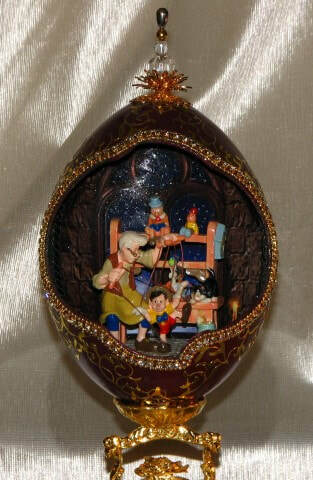 Snow White figurine is added to the basket, along with some animal friends from the forest. 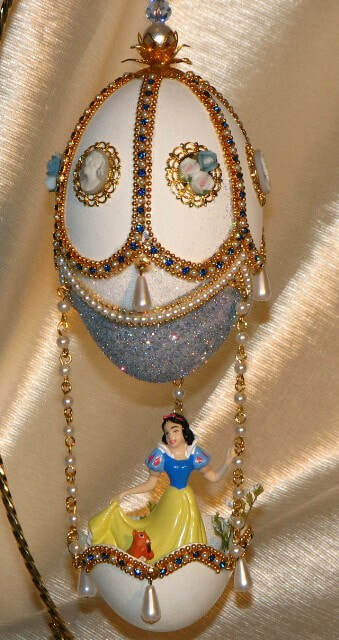 Pearl drops are added as the finishing touch to this classic fairy tale egg. 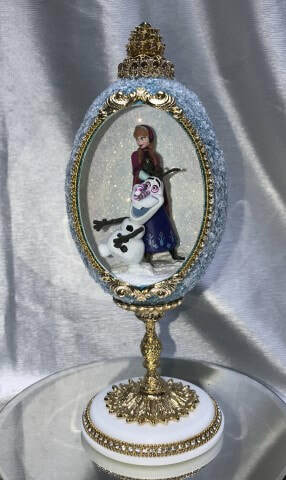 A decorative gold stand is included with your purchase. 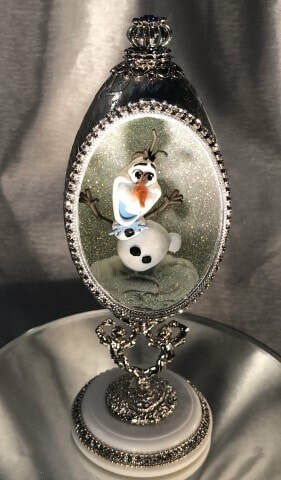 ​Our favorite lovable snowman is featured in this goose egg design. 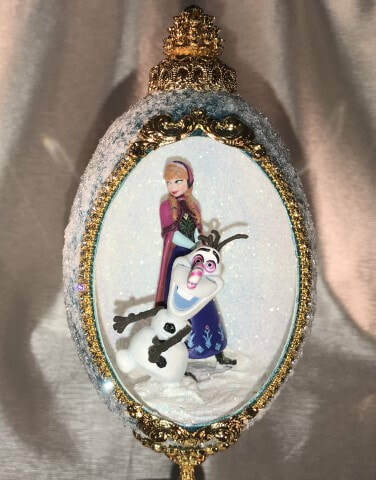 This design is hand cut and accented with Austrian crystal chain and decorated with elegant design decals. 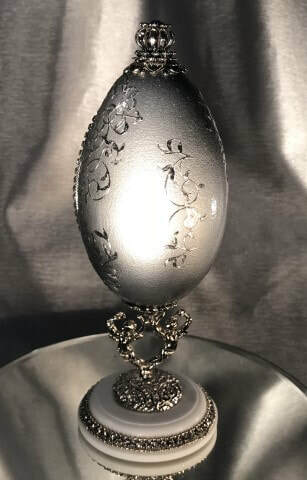 The silver stand is supporting our design and topped with a crystal finial top.